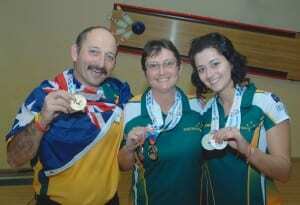 The Sachs family of three flew to Israel last year to compete in the 18th Maccabiah Ten Pin Bowling tournament…and each family member won at least one medal. Tonight Phil Sachs will be the flag-bearer for the Australian team at the Maccabi Australia International Games Opening Ceremony at Sydney’s Olympic Park. In Israel, Dad Phil, 53, took out Gold in the Masters event while Mum Debbie 44, walked away with two silvers, one in the teams and the other in the triples…as did daughter Lena. It was Lena’s first Maccabiah during which she celebrated her 21st birthday but it is Phil’s 4th and Debbie’s 3rd. For Phil, who hails from Sydney’s Northern Beaches, the medal ceremony had special meaning as it was the first time he had struck gold. Tonight’s reflection on Phil Sachs’s success should make it a night right up everyone’s alley.